Easy, fast and mostly plant based recipes are her specialty, but she also shows you how you can adapt most any recipe to suit your own dietary needs! Use the search box below to find specific recipes or meal planning content within this site. See all of Carolyn’s yummy food creations and more via her Instagram feed! Or via her Facebook page, Carolyn’s Blooming Creations! Inspired by Evolution of Juice’s “Defense Up” smoothie, I created this awesome alternative using only 4 ingredients. It’s packed with vitamin C, thanks to the acerola cherry powder. We love this in our house during cold and flu season to keep us moving and shakin’! Learn more about acerola cherries via this link to the site healthline.com. When blended, it gets frothy, similar to an Orange Julius drink, but this one is much healthier and better (in my opinion!). Important Note: I used 100% non-GMO or organic pure juices with no added sugars. This is an important factor to keep this drink as healthy as possible. 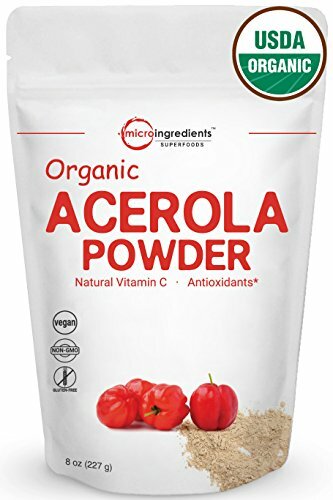 3.2 grams of acerola cherry powder (3.2 grams is approximately .64 teaspoon. I used the scoop that came with the powder to measure out the 3.2 grams. Using almost 3/4 of a teaspoon would work for this recipe if you don’t have a 3.2 gram scoop. I bought my powder via Amazon. See the photo and link to buy it below this recipe). I blended my juice with my Magic Bullet to make it frothy. If you’d like the same effect, use a blender or whisk vigorously by hand. Did you make this recipe or have feedback? Leave me a comment or fill out the form below! Thank you for your message! We’ll be in touch with you shortly. Have a great day!